This week, I'm excited to welcome Antasha Durbin to Mumbles & Things to share her knowledge about learning to read Tarot. 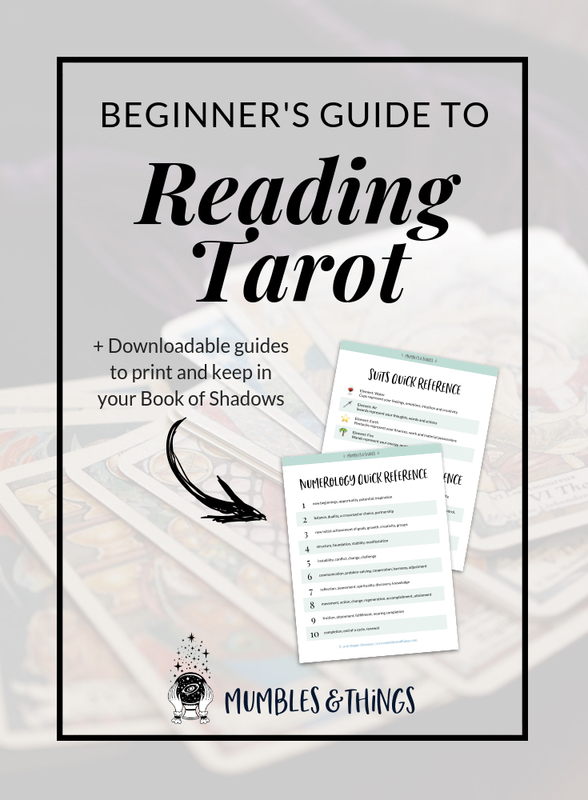 I hope you enjoy her step-by-step approach to reading Tarot. Tarot readings have been used for hundreds of years as a way to connect people with the divine universe and answer important questions about love, career, finances, lifestyle, relationships and more. If you’ve bought your first deck, and you’re unsure of where to begin and how to conduct your readings, start here. This simple guide will walk you through an 8-step process that will allow you to connect with your deck, intuition and the universe at large. You know how when you first enter a new relationship things are a little awkward and possibly uncomfortable at first? But, once you get to know the other person, you’re able to relax and let go. Look at your deck from the same perspective. Spend time going through each one of its cards and familiarizing yourself with them. Funnel your energy into your deck, and give it the same care and love you would to a partner. This set of cards is a gift from the universe — one that allows you to receive guidance and get the answers you’re seeking anytime. Respect it. Love it. Appreciate it. 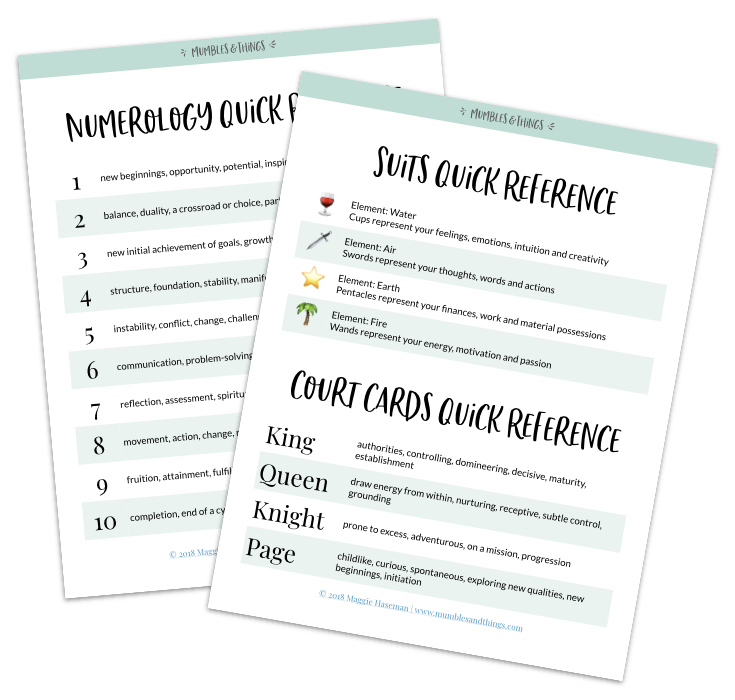 Each tarot deck comes with its own super helpful book that breaks down the meaning of each card (as interpreted by the author), suggested spreads, and guidelines for how to do the readings. And while these books are very insightful, I recommend you use them as a guiding point ONLY. Rather than trying to memorize each cards' interpretation word-for-word, instead read through the book 2 or 3 times and become familiar with the overall theme of each card. As an example, let's say I pull the "Deception and Envy" tarot card from my Psychic Tarot deck. "To be forewarned is to be forearmed. This card comes at a time when individuals or conditions aren't what they appear to be. How well do you really know the people around you? Are they telling you everything you need to know? In business, make sure you gather all of the necessary information so that you're aware of and understand all the facts before continuing. You've worked hard; don't let others take from you what is rightly yours." But, maybe my question was: "Is now a good time to adopt a dog?" "Before you adopt a dog, consider all aspects. Research the shelter. Don't make hasty decisions. Weigh all of your options. There are some people out there who will be eager to take advantage of your kindness and may sell you a dog that isn't a good fit for you or your life (sick, bad behaved etc.). Have a plan B ready, and consider waiting for another time." Whenever you do a reading, you ALWAYS want to tap into your intuition because ultimately, that is your guiding compass through life. Imagine you're setting your house up for your first-ever at home date with your new love. You want to make it special, memorable and inviting so you light candles, turn on classical music, open a bottle of wine and craft a beautiful home-cooked meal. Your date walks in awed by the atmosphere and feels immediately welcomed. You both have a wonderful evening together and look forward to the next one. Approach your readings in the same manner. Light candles. Put on soft, inspirational music. Clean your house. Open a window and let the fresh air in. Make your reading space sacred and memorable because doing a reading is magical and transformational and needs to be treated as such. You will literally be uniting your energy with the divine, as you're guided to receiving answers to your questions — how cool is that? As a beginner, it's going to take time for you to really get to know your deck and listen to that intuitive voice within. So rather than asking a broad question that might confuse you or be overwhelming to interpret, keep your question clear and concise. For example: "Should I quit my job in three months?" or "Will I find a partner this year?" The clearer you are, the easier is it for the universe to deliver you a clear answer. There’s no right or wrong here, select whichever option feels most fitting for you. This is one of the most often overlooked (and in my opinion one of the most important) steps in reading tarot! Before you dive into your deck and start selecting cards, take a few deep breaths in and out with your eyes closed. Once you're relaxed, keep your eyes closed and call out to your spirit guides, God, the universe (whatever terminology you're comfortable with) and ask to be surrounded by love and positive energy. Then ask your question (silently or aloud) and request the clarity and guidance in receiving the answer. Keep it simple and start with a 1 (quick answer) or 3 (past, present, future) card spread. This will allow you to begin understanding how to interpret the cards, follow your intuition and begin building your confidence. Then once you master the more simplistic spreads, you can begin to dive into a variety of more complicated and in-depth spreads. Once you've selected all of your cards, it's time to interpret what your reading means. Keep in mind, initially, you might be confused. Learning to read tarot is a lot like learning a new language or how to play an instrument. It's going to feel foreign at first, but the more you do it, the easier it will become! Above all remember, you get out what you put in. If you believe your reading will work, and you allow the universe to guide you then you will receive the answers you're seeking. ABOUT ANTASHA: Antasha is a spiritual writer, life-long student of the universe, and psychic tarot card reader. Her website, cajspirituality.com, is dedicated to casualizing the spiritual experience and making it attainable for anyone, anywhere, anytime. Follow her for free, easy-to-digest and highly actionable advice on spirituality, mindfulness and empowered living. What is your experience with Tarot? Are you a newbie? Let me know in the comments below.